What we mean by fair construction? Exhibition constructionis creative building on time and requires besides creativity, expertise and experience and craftsmanship and perfectly coordinated processes. We create exhibition booths cost-conscious in the conventional system construction, but also rely on their own individual, customized stand architectures. From simple system building on the individual stand constructions to large-scale exhibition stands we offer all options from a single source. What makes us as exhibition stand contractor? With years of experience in trade fair construction, we ensure that we properly place your trade show appearance in scene and excite your customers. Through an individually created concept will ensure a unique appearance and provide a high recognition value. Profound expertise and experience in planning and holistic design and implementation are the basic building blocks for a successful trade show presence. Our services are comprehensive and anytime tailored to the needs of our customers. From an individual overall concept that reflects your very own profile, to modular systems, we offer everything from one source. What are the major features of a stand? What are the major features of a stand? Your exhibit should document the uniqueness of your business, make it palpable and tangible. 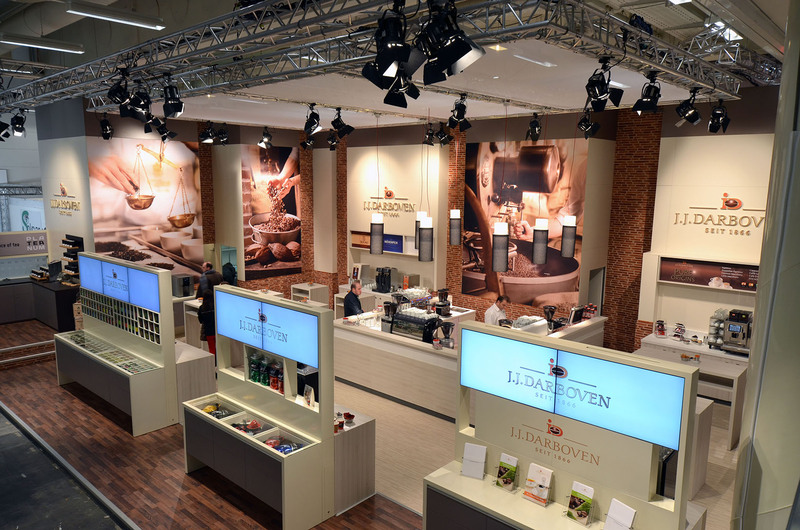 A successful exhibition stand is the three-dimensional continuation of your corporate communications – an optical, haptic and emotional experience of your brand. Against this background creates the hmb hanseatic messebau GmbH from Hamburg for more than 25 years customized concepts for trade fairs of all kinds. Where we build for them their stand? The team of hmb hanseatic messebau develops fairs in Hamburg, Germany, as well as almost all internationally renowned trade fair locations. As a full service partner with its own project planning, production, graphics and logistics working for major international brands as well as for companies in the region. With our OSPI partner network, we are able to work in over 5 continents hand in hand according to the same Prdodukt and quality standards. Whether in Hamburg, Shanghai or in Rio de Janeiro, with the slogan “DESIGN HERE BUILT THERE” we build your stand cost-effectively and quickly to every fair in the world.